In this guide we’ll take a look at some of the best music production courses and schools to choose from. Music Production Nerds is reader-supported (we do not rely on sponsorships). If you buy through links on our site, we may earn a commission. Thanks for understanding. Quick answer: we consider the top three online platforms to be Noiselab for Ableton users, Producertech for a variety of electronic music producer styles, and Masterclass for Hans Zimmer’s film scoring course, among other music production courses. As you know, there is a vast amount of knowledge on the subject, and just grouping them into three choices may not suffice – so while the top three may cover the majority of readers, we’ve taken into consideration the needs of many. And while to some the subject of music production can seem like an exciting yet daunting endeavor into the unknown, we know that the best way of dealing with this, and therefore satisfy your hunger for knowledge in a way that keeps your enthusiasm alight, is in finding the perfect teachers and guides to assist you through a rewarding learning experience. If you’re a beginner reading this, you should know that there are different kinds of programs to choose from – from studying music theory, to the engineering side of things. You need to know about plug-in software and soft synths, and how to use them. You need to get yourself familiar with the various terminologies within the art such as compression, delay, limiting, noise. You need to know what are the required equipment, and how to use them effectively. Add to that the fact that, as a producer, you’ll need to produce a sound that is competitive. And by that, I mean that when you release a track to the world from any one of the online platforms that exist to distribute your music, your music has a chance of getting the respect it deserves from the public. If you’ve been following the latest trends in music, particularly electronic music and pop music, but especially within EDM genres such as Future Bass, Dub Step, and House music, you’ll know that music production is as much a skill as it is an art. It’s the reason why YouTube has blown up with so many videos on the subject from amateurs and pros alike. So, it can be particularly exciting, for intermediate and pro producers, to recognize all the potential various ways to accomplish a sound that they hear and try to emulate it. So wanting to get your hands on the latest gear, techniques, and tricks to sound like your favorite songs, old and new, is natural and there are ways to learn how to do so. Pro readers will know this, that at the very basic, there are some essential things you need to learn. And then, once you advance, you can continue learning newer techniques and ways to create and mould the sound that you want – the sound that is sitting within you waiting to be expressed. That is what this post is about. Here, we’re going to look the best places where you can get music production online courses and tutorials that will develop and hone your skills as a music producer. If you are lost and need a place to turn, continue reading, because the information here may possibly contain the next step that’ll bring your dreams and potentials to reality. This post is primarily for beginner to intermediate music producers, as well as advanced level producers and engineers looking for additional learning supplements. The resources here provided are useful not just for introductions, but for keeping your skills relevant to the current trends you need to learn to be ahead of the music production game. The benefits are obvious. Learn at your own pace. Learn from home, or wherever you are. You also get support from others online in forums and chat. Online learning platforms are great places to turn to because it is convenient. In addition to that, in the many examples I provide in this post, you get the opportunity to connect with other learners and professionals on the platform, which could go toward building relationships that could lead to collaborations and more recognition and feedback. The internet is a collection of communities sharing in various interests. Many of these communities tend to congregate at learning platforms, so you have the ability to find people you need to connect with to build your skills and possibly advance your career even further. Are there any drawbacks of music production online courses? Not a lot, actually. The only real drawback would be the lack of in-person feedback. In that case, you need an apprenticeship of some kind which would supplement doing courses and tutorials. 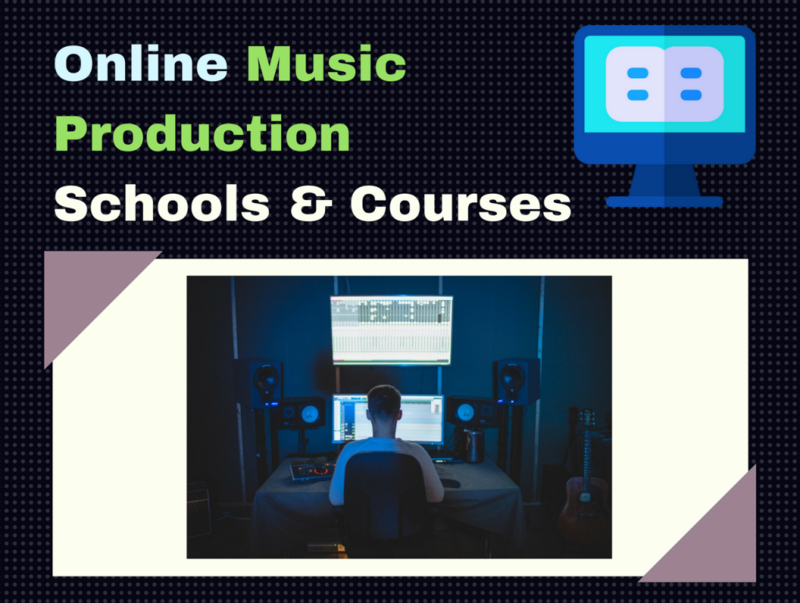 Why should you take an online course in music production? It’s obvious, you want to learn how to make music or edit music, you want to advance your skills and become relevant in a competitive field. And you want training from professionals who know what they’re doing, love what they’re doing, and love sharing that knowledge with you. Tip: You can also use the courses guide at the bottom help you quickly narrow down and isolate the best choices for you, based on the content of each course. If you’re primarily interested in electronic music production courses and tutorials for Ableton Live, then Noiselab is one of the best options. That’s because Noiselab is a site dedicated to Ableton Live tutorials. Not only is it a hub for music production courses, it is an online community of Ableton producers and electronic musicians, so you know that there’ll always get support for your questions. Also, they give training from certified Ableton trainers and successful producers from around the world. They say they believe in learning from the best, and that certainly seems like what this site offers. The site is updated every month with new courses which will keep you up to date with the latest trends in electronic music and music production. When you sign up, you get unlimited access to all courses and content, which you can access from any device, anywhere you are, at any time, being connected to the best in the industry. The community is over 5000 producers strong, meaning lots of opportunities to meet others and make connections. If you’re new to music production, or a beginner (or “advanced beginner”), I’d recommend the three-part foundation courses ‘Electronic Music Production I to III’. Part I is actually free online. 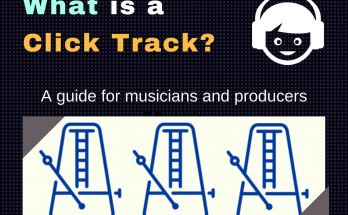 An essential course for every music producer. Learn music theory as it should be for electronic music genres. 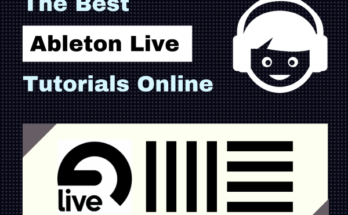 You can learn to use Ableton Live for either as DJing Program or a Live Performance Software. The choice is yours, and you can master Ableton by following those courses. Starts at $19/month, or you can start with their free course ‘Electronic Music Production I’ until you decide. This is a great place if you want to learn not just how to produce music, but get tutorials on genres such as house, hip-hop, EDM, etc. 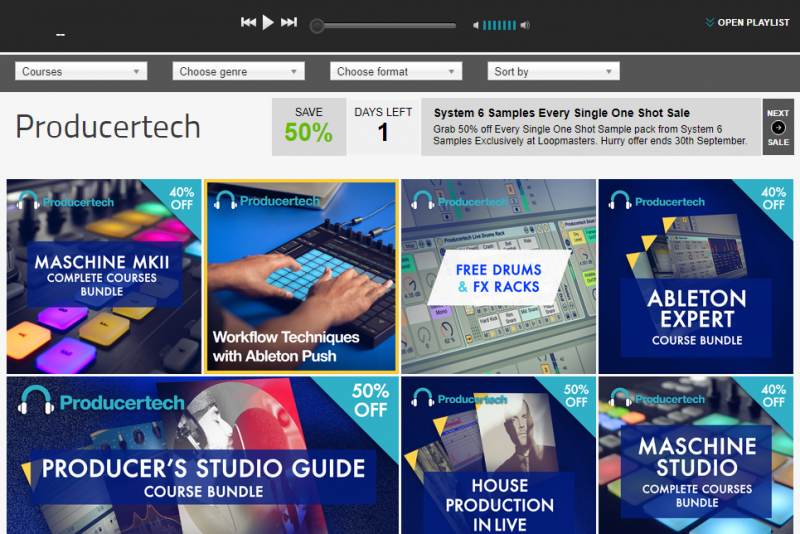 Not only for producers but for DJs and other electronic musicians, ProducerTech is an online learning platform that is specifically geared toward electronic music production. Especially so for electronic music as they have courses are more geared toward the electronic music genre than music production in general. ProducerTech was founded in Eastbourne, UK, by Rob Jones (certified Ableton Trainer) to offer two core courses on Ableton Live. These courses are for guiding complete beginners to advanced level users. The site was designed to take students with little or no experience in music production all the way up to the advanced level. The good thing about this ProducerTech is the integration it has with Loopmasters. If you plan on taking music production courses from ProducerTech, you get access to audio samples by Loopmasters. Some other cool things you’ll find useful are the fact that you can download the course packs, which includes Ableton Live sessions (project files) for each of the courses, plus the Loopmasters audio samples, and the written notes for the lesson, as well as any other additional learning material. If you have any questions, you can contact ProducerTech about the courses you’re taking, or on music production or electronic music in general. Just like many of the choices on this list, they also have their own forum, where you can discuss with other students and trainers. It’s encouraged to share your music within your forum so that you can receive feedback on your music and its progress. This a great feature, keeping you from getting stuck within your own creative bubble. At the end of the course, you get a signed certificate saying that you’ve completed a ProducerTech course. Though ProducerTech is a mostly Ableton Live learning platform, they have expanded to include courses on Logic Pro, Cubase, and Reason, as well as Maschine, and plug-ins like Massive, Omnisphere, Kontakt, and Sylenth1. The tutors on ProducerTech include some top and famous producers such as Paul Maddox, Defazed, Reso, DJ Fracture, and Rob Jones himself. There are dozens of them on that platform, which means lots of great material to sift through. You can learn by software, genre, skills, or chose the core courses on Ableton Live. You can even get courses in remixing the top hits like the pros. That’s just a fraction of the courses they offer. You can check them out for more courses suited for you. The course price varies from course to course, take a look at their prices. Masterclass is an online educational platform intended specifically for creative professionals. The site covers a comprehensive range of subjects, encompassing a wide variety of creative endeavors. In addition to writing, acting, cooking, and comedy, Masterclass also offers a selection of music instruction courses from some of the most respected figures in the music and entertainment industries. Courses are provided in a series of video lessons, which last anywhere from five to twelve minutes. In addition to technical discussions and theory-oriented lessons, instructors also share personal anecdotes and professional insights relevant to the subject matter. Among the music courses offered are Tom Morello’s in-depth guide to playing electric guitar, Herbie Hancock’s informative jazz course, and Christina Aguilera unique insights on singing and vocal performance. There are also courses by Armin Van Buuren, Hans Zimmer, and Deadmau5, which we cover in detail below. As you may know, Armin Van Buuren is a DJ, record producer, and remixer from Holland. Since 2001 he’s hosted the very-popular trance music radio show, “A State of Trance.” The show is aired to more than 37 million listeners in over 80 countries around the world. In addition to that he was been named DJ Mag’s number one DJ a total of five times, breaking the closest record by a wide margin. He has also landed in the top 4 in DJ Mag’s Top 100 DJs list three times, and was nominated for a Grammy Award for Best Dance Recording in 2014. 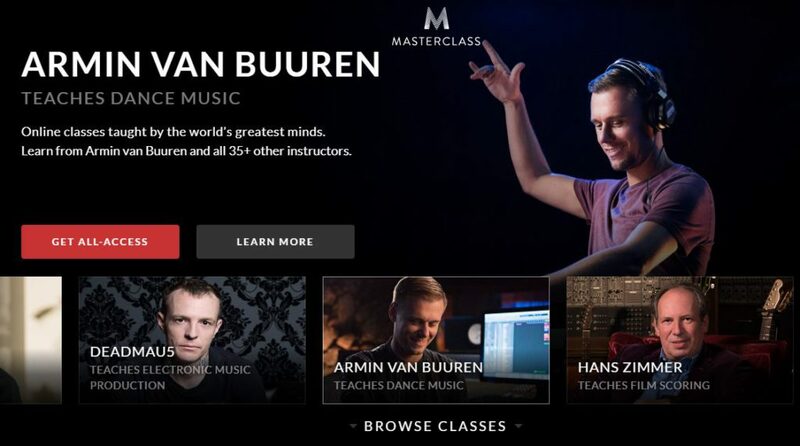 In the “Armin Van Buuren Teaches Dance Music” master class, you’ll learn a staggering range of topics from the top DJ as it pertains to electronic dance music production. From building a track from scratch to producing, performing, and even promoting your music, you can learn it all over the course of 33 in-depth lessons. Hans Zimmer is probably a household name at this point, and probably needs little introduction, but it is good that we have a choice other than EDM, as some of you may be interested in scoring. To the uninitiated, Zimmer is an A-list film composer and record producer whose work spans a large range of Hollywood blockbusters. The man behind the music of some of the biggest-selling films ever made, he has lent his formidable talents to the Pirates of the Caribbean, Gladiator, Interstellar, The Dark Knight Trilogy, and Inception, among others. Hans has received no less than four Grammy Awards, one of them for the Best Original Score for The Lion King. In the “Hans Zimmer Teaches Film Scoring” master class, Zimmer goes over an expansive range of material over the course of 31 video lessons. From combining synthesizers with orchestral instruments to working with directors and scoring to specific scenes, Zimmer covers it all in exquisite detail. You will especially appreciate Hans’ informative discussions on scoring specific films. In particular, his notes on scoring for Sherlock Holmes, The Batman Trilogy, and The Pirates of the Caribbean are well worth the price of admission. Who wouldn’t want to learn from one of the icons of modern music production? The artist currently known as Deadmau5 was born Joel Thomas Zimmerman in 1981. Since then, the Canadian native has catapulted to the top of the dance music charts and the public consciousness, with a string of distinctive productions paired with his equally distinctive mouse-head stage get-up. More than just a gimmicky flash-in-the-pan, Deadmau5 brings an impressive array of studio chops to the table in producing some of the most memorable dancefloor fillers around. With an uncanny ability to crank out sizzling-hot tracks in a wide array of musical styles, Deadmau5 is at the forefront of the wave of EDM that currently has the world in its grip. Over the course of 23 video lessons, Deadmau5 provides detailed instructions on how to craft captivating melodies, cook up unique sounds, and mix and master tracks like the pros. You also get valuable tips and tricks on how to work with specific tools, build a studio on a budget, perform on stage, and even advice on managing your career. Many students that have signed up for the Masterclasses especially appreciate the depth and range of the material available. For many, the opportunity to get detailed instruction from some of the foremost practitioners in their respective crafts was more than enough reason to sign up. Despite the depth of the material on offer, most students nevertheless found the individual lessons easy to digest. With most videos lasting from five to ten minutes, it is easy enough to grasp the key concepts without getting overwhelmed by too much information. The price of the individual courses did give some students reason to reconsider. But the 30-day money-back guarantee definitely helped to ease any reservations. In general, most students felt that the Masterclasses provided exceptional value for the money, and few opted to take advantage of the money-back guarantee. In a world filled with dozens of online courses, few come close to delivering the range and quality that Masterclass provides. The quality of the instructors and of the lessons themselves is nothing short of impeccable, and you would be hard-pressed to find courses of equal value. Masterclass.com is perhaps better suited to those interested in a broader, more expansive coverage of their chosen subject matter. A bit of familiarity and experience with the topics is useful, and some of the more intricate details tend to be glossed over in the interest of providing a “big picture” overview. Nevertheless, Masterclass is pretty much the next best thing to studying with the masters personally. If only for the sheer depth and range of material offered, Masterclass is well worth checking out. Among the online platforms on this list, Point Blank Music School is an actual traditional music academy dedicated to music production, with physical locations in London, Los Angeles, Ibiza, and Mumbai. However, as this is the topic of online music schools and courses, I’ll just focus on the online stuff that they offer. But if you’re interested in their months-long immersive training programmes from high-level teachers on the professional equipment, an enrollment in one of the four locations is just a click away. The range of courses offered online is pretty impressive. For one, this is the only site on this list where you can actually earn a bachelors diploma, a professional diploma, or a certificate diploma in music production, totally online. Besides their online diploma offerings, you can enrol in their professional programme courses. Point Blank offers these in Logic Pro, Ableton, Native Instruments, Electronic Music Production, Music Composition, Music Industry, DJing, etc. If you do not want to enrol for the longer courses, they also have shorter courses for you to take. The people that teach at Point Blank are people who have worked with Pharrell Williams, Depeche Mode, Massive Attack, Swedish House Mafia, Jamiroquai, La Roux, and others. The nice thing about their online packages is that they offer very good student discounts on many music production products, as well as free products like Ableton Suite when you enrol to take some of their courses. Just look at some of the courses they offer, and you’ll see what you can save on once you sign up. They also have their own forum called Plugged In, a community of professionals and students sharing and exchanging ideas. It’s also a great platform for finding new opportunities to collaborate with people around the world. That being said, Point Blank Music School is a full music college whose learning resources can be utilized online or on campus. We think this is an excellent choice as one of the best online music production schools for anyone serious about entering the music industry. If you want a more traditional approach to learning music production from a music academy, but want to do it online, and maybe get a degree, this is the best solution our consideration. You can take a look at what they have to offer and you can tell for yourself. Coursera is an amazing platform for not just learning music production, but subject matters across many disciplines. Among the online learning platforms on this list, this is one of few where you can actually earn a certificate that can be used on a resume or CV, as well as a Linkedin badge, showing that you’re competent in your field. Essentially, Coursera is like an online university, as the platform has partners with many top colleges and universities around the world to offer top-level education at a small cost. You won’t get a university degree or diploma, but you will get a certificate saying that you gained or mastered skills that would be useful for getting jobs or furthering your career. If you’re interested in becoming a music producer, We’d suggest receiving a certificate in at least one course in that subject from Coursera, as it would serve the purpose of accrediting you with a valid certificate within that field. That being said, can you actually earn college credits from Coursera? For music production, unfortunately, no. But, in the close future, that may be possible, as they seem to be moving in that direction, anyway. Currently, there are 5 courses on Coursera that has been approved for university credits by traditional university institutions. This is inevitable, as more and more people are turning to the internet for education. Coursera even offers you the opportunity to apply for financial aid. Which is great if you need training but are short of funds. The courses we recommend from Coursera are all created by university professors at the Berklee College of Music. The Technology of Music Production – Learn the technical and engineering aspects of music production. The Art of Music Production – Learn how to create good concepts for albums, guiding artists’ as your career, and the secrets of how to create and produce a hit record. The Art of Vocal Production – Learn how to capture vocals for recording professional high-quality songs with artistry. Pro Tools Basics – As a producer/engineer, it is a good idea to at least get to know the basics of Pro Tools. This course introduces that DAW to you. Creating Synthesizer Sounds for Electronic Music – Especially good for electronic musicians as well as any producer is understanding the synthesizer. It’s a fascinating instrument if you know your way around it. You can learn the fundamentals to create your own sounds from this course. If you want the most all-around learning experience, plus earn a certification which you can use on a CV, we recommend the Music Production Specialization Program. The Specialization Program consists of 4 courses in total (The Art of Music Production, The Technology of Music Production, Pro Tools Basics, and Music Production Capstone), which you cover over a period of a few months (or however fast you can take it) to completion. All of the courses are free to audit, which means you can watch the videos and view some course materials for free. You pay when you want to get a certificate, do the Specialization Program, and for access to tests, grading, and the ability to do projects. Those who have taken The Technology of Music Production, The Art of Music Production, and Music Business Foundations, have found them very helpful in equipping themselves with all they need to know to self-start their own career. You do not need any knowledge of music production before you start these courses, so they are good for absolute beginners as well as those who are a little way along in the game. You can also pay for individual courses as you go, the prices of which vary up to $150. If you’re on LinkedIn then you probably know about Lynda.com, another online learning platform geared toward professionals and career minded people. That said, we all can therefore assume that the tutorials provided here would be of a certain quality, for the direct purpose of providing content that advances the skills needed for professionals or career driven people. In this case, that would be music production and its related fields. Lynda is actually a veteran of online courses, since it was founded in 1995 as an online platform to supplement educational books by Lynda Weinman. Since then, it grew into a massive business, so big it was acquired by LinkedIn as a learning platform for their professional social network. The catalog of courses in music production is simply massive. Given the reputation of this site, you know that you’d probably end up learning music production from some big name person in the music production business. People like Yeuda Ben-Atar (aka Side Brain), Brian Lee White (founder of Finishing Move), and J. Scott Giaquinta (founder of the electronic band Deepsky). Because the catalog of courses is simply massive, we’ll just look at some essentials for you to start with. Music Production Secrets – Learn music production techniques of some of the world’s best musicians, from Tape Op magazine founder and Jackpot! Recording Studio owner, Larry Crane. Audio Mixing Master Class – Learn the art of mixing and mastering your tracks from Bobby Owsinski, a best-selling author (23 books) and thought-leader in the music business. Or subscribe to Lynda’s Music Production ‘Learning Path’ for the 39 hour program teaching you everything you need to know about music production. There are also courses in Pro Tools, Ableton, and other DAWs, suited for beginner, intermediate, and advanced levels. As it appears, then, that there is a course on Lynda for everyone, especially for the professionally-minded, career-oriented learner. You may, or may not be, familiar with Udemy, the online learning platform that offers courses and tutorials on many subjects. You can get many low-cost tutorials and courses on this platform on anything that you like, music production being among them. What you will like about Udemy is that you don’t have to be a beginner to utilize their platform, one could be the most advanced music producer in the world, and still find something on here to learn. There is always something new to learn, and that’s the beautiful thing about Udemy, as their massive amounts of courses will provide you with a potentially limitless learning experience, once you sign up. Udemy is simply massive. They have over 55,000 courses from expert instructors. Enjoying a lot of success in the online learning business, millions of people turn to Udemy for instruction for success in their own field. Udemy calls themselves an online marketplace for providing training in skills to help others develop and become more competent in their respective disciplines. The learning platform is designed as an intuitive learning space where you can enrol in a class, learn at your own pace, and have unlimited access to all content for a small fee. Music Production I – Learn to be a Music Producer! 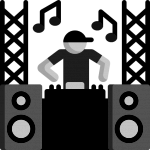 Mixing Music – Learn how to mix a Pop Rock Song like a Pro! As you can see, Udemy offers a tremendous amount of courses to choose from. But the ones listed above should be good to start you off. If you’re familiar with Envato, you might find Tutsplus somewhere you’d like to learn some techniques in music production. This is a rather new place, though, with content being added over time. Envato Market, of which Tutsplus is a part of, is a place that offers content for professionals and freelancers. 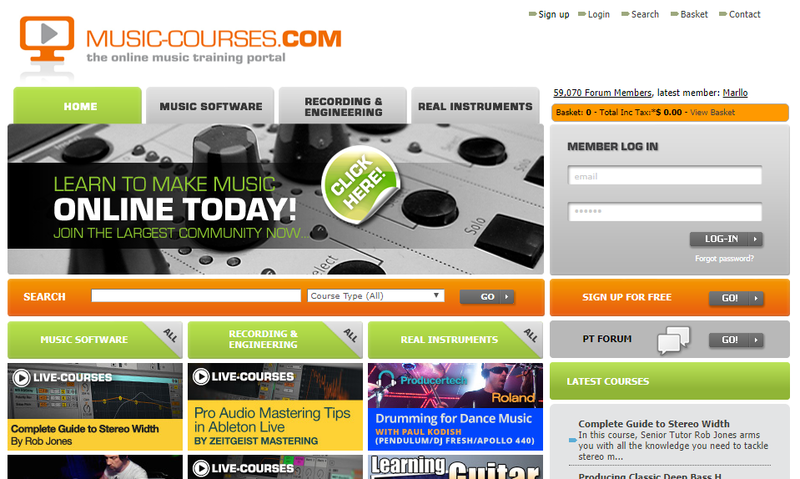 You can buy sound samples, website themes, and now with Tutsplus, courses are available to help you in your business. Music production being one of them. Tutsplus is rather new, however, with limited tutorials, but take a browse through to see if there’s anything that interests you, particularly in specialized skillsets. As said, they offer courses across many subject areas, maybe there is something there for you. Music-Courses.com is an online training portal that has been around for a long time, and so it may be a little long in the tooth, but it continues to provide quality music lessons and courses of all kinds. Unlike many of the options mentioned, as an online learning platform for music, it is not entirely focused on just music production. You can take guitar lessons, bass guitar lessons, drum lessons, vocal lessons, and keyboard lessons. So if you want to brush up on your instrument playing skills (a very useful component to music production), this a good site to get your music lessons. As for the music production, Music-Courses.com offers courses in Recording and Engineering, Audio Mastering, Recording, Audio Mixing, Audio Processing and DJing. For software, you can get courses in Cubase, Ableton, Reason, Logic, Pro Tools, Maschine, and soft synths (a short term for software synthesizers, such as Massive, Serum, and Sylenth1). Whereas the other options provide courses from dedicated instructors within the online learning platform of your choice, Music-Courses.com collects these courses from the top training companies around the world, so there will be a variety of styles to choose from based on what you like and need, as well as really good quality. You’ll like how the courses are organized into easy to understand categories of Recording, Software, and Musical Instruments. If you’re a Cubase user and want to improve your skills, then you go to the Software tab and select the Cubase course. If you want to learn the art of studio engineering and recording, maybe because you’re building your own home studio, or you want to work at a major recording studio, then select your course under the Recording & Engineering tab. And because learning an instrument is a vital part of any music producer’s career, as it gives you a feel of music to actually play it and understand it, you can learn an instrument of your choice under the Real Instruments tab. One would think that, of all the choices presented in this list, this is an all-around great option if you’re looking for a one-stop shop for all your music production online education. It doesn’t matter if you’re a beginner or a pro, from the options we can see here, they have something for everyone. And from the music production forums I’ve read online, this has been a favourite that pops up in topics about where to learn music production online. They also have a forum, which is actually the ProducerTech forum, so you get to share ideas and your music, as well as develop relationships, build connections, and collaborate with other producers professional and students. Whereas ProducerTech is more electronic music based, you can get a more rounded education from Music-Courses.com in various aspects of music production which includes producing and recording any genre of music. They are also affiliated with PluginBoutique and Loopmasters, meaning you have the opportunity to get access to premium plugins and audio samples. I don’t know if this means free or discount rates, but either way is good. Learn at any level, beginner to advanced. It varies, based on what courses you decide to take. If you’re a MacBook user or plan on getting a MacBook for music production, MacProVideos is an online learning platform to get your tutorials for anything music production and engineering on a MacBook Pro. 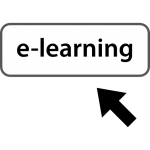 All the courses on this site are dedicated toward learning on a MacBook. The learning platform is not just for music production. They have courses on video production, web development, graphics, productivity, and others. So this is not just a great place to learn music production, but to learn all the skills that may be needed to build out your career and your business if you ever plan on getting that far. Their library, to date, is currently stocked with over 1113 courses, and 64,014 tutorials, with new material added every few days. Their courses are taught by certified and experienced music producers and musicians in the field right now. Many users consider the quality to be highly rated, from the content to delivery on practically any topic, application, plug-in and software you can think of that you need training on. You can either stream the courses online or download them to your HD. And with a subscription plan, you have access to everything online, which you can reach from your Mac, PC, or iOS device. With a paid membership, you also get access to the MVP Hub where you can expand your knowledge, as well as join the active forum where you can chat, share, and connect with, and get assistance from others on the platform. Subscriptions: $25/month, or you can save 60% and go yearly for $120 per year – See subscription. Individual Titles: You can get 20% discount on individual courses by ordering from this link. With so many to choose from, how are you to know which one is right for you? Certainly, all the selections presented here must be good, or else they wouldn’t have made it into this guide. But as we must take our journey at a given point and not from all points, narrowing down to a single selection is the ideal solution. Below we’ll take a look at a list of criteria, organizing the best online music production courses and schools suited to your particular need. If you’re into making and producing electronic music, especially on an Ableton based computer, the best choice for you would be the recommendation of Noiselab for everything Ableton Live if you are a beginner, or ProducerTech which tends to specialize on genre based courses for Ableton and other DAWs. If you want to learn electronic music production that’s not entirely Ableton Live focus, ProducerTech as well as the courses from Masterclass would be your best choice, with ProducerTech being the top choice when it comes to narrowing down on what sort of DAW you’re using. It’s hard to bear learning from the king of film scoring from Masterclass’ Hans Zimmer course. You can supplement his lessons with others you’ll find on Udemy, but we’d certainly consider giving recommending this as you the top choice. If you want a valid certificate that says you completed courses at a music institution’s online course, Point Blank Music School and Coursera and are your choices. Point Blank will take you all the way to advanced level and even give you a bachelors degree if you want one. For online courses in music production from other learning platforms where you can also sign up for any other kind of courses that exist, Lynda, Udemy, and Tutsplus is for you, with Lynda being our favourite simply because of the LinkedIn integration, and the quality of trainers that exists there. For learning music production in a style or genre that is not geared toward electronic music or EDM (like country, pop, rock, reggae, etc. ), then you should get your education at Music-Courses.com. As you may have come to realize, there are several resources to choose from to get your music production education. If you’re a beginner, you’re covered. And even advanced level music producers can keep up to date on the latest trends and brush up on their knowledge, as well as create courses of their own. It’s awesome that so many opportunities exist online where once they didn’t. Hopefully you found this post useful. If you want to learn more about music production, check out one of these courses and sign yourself up. Learning from the best is the greatest way to improve. If you found this post on online music production schools and courses useful, or have any questions or comments, please leave a comment below. Otherwise, share it with your friends, or anyone you know would be interested in developing their craft. Studied at AIM myself – Audio Engineering CIII back in the analogue days, might be time for me to update my skills! No tape cutting or punching these days – pro tools pro tools pro tools ha. I remember when the audio engineer I worked with on an album would tell me stories of “back in the day” when they used to do tape cutting. And it wasn’t even so long ago! Now every studio is using Pro Tools, even to control and automate the mixing board (which the engineer endearingly referred to as “studio furniture”. Ha). Thanks for reading my post! You’re definitely no beginner. 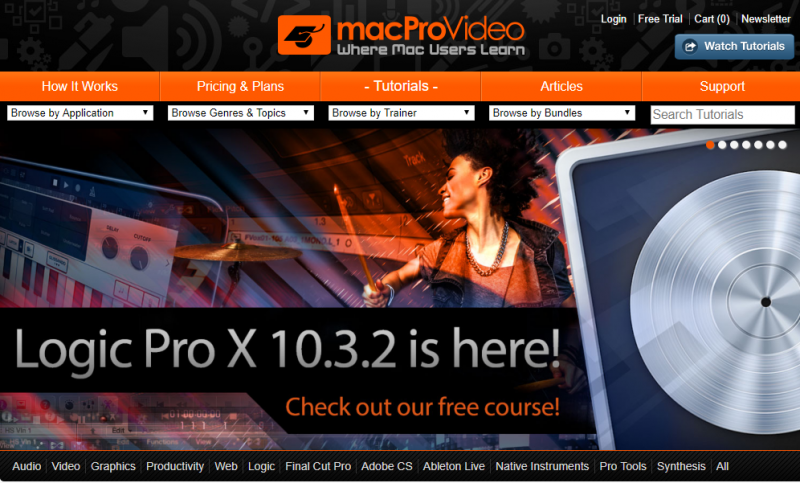 From what you said, I think taking the Pro Tools courses on either MacProVideos (if you’re on a Mac), Lynda, or Music-Courses.com would be the best option. Hope that helps. If you need help finding the best course don’t hesitate to respond. Wow thanks for the extremely comprehensive post on online music production schools. You obviously really know your stuff! As a fellow musician I have been looking to improve my music production skills, I’m not quite in the position to enrol on a course right now but would like to in the future. In the meantime I would like to continue learning by myself, I’m basically really good on garage band and I’m now looking to step up to a more advanced music program. What program would you recommend as a good transition up from garage band? Here are a few options for you to consider. Logic Pro is like the next step above Garage Band. You’ll find that they both have the same interface, but Logic is a lot more advanced a digital audio workstation than Garage Band. You might find yourself watching a few tutorials about it, but the transition should be very easy. Studio One is another DAW that I consider a very good transition, especially for people just getting into using DAWs. Plus many pros use this DAW as well because it offers advanced features within an interface that is easy to use. You can read my review on Studio One here. You can also read my review on 10 different DAWs, including Logic, and chose which of them you’d like from my best 10 DAW review. There are a couple more options, Ableton and Bitwig. You said that you’re a musician, and these DAWs are primarily good for musician-based producers over arranger-composer, or engineering producers. You can set these DAWs up for live performance with your instruments and loops. Read my review on them in the link on the 10 best DAWs I provided. I hope that helped. I know I provided a lot of options, but let me see if I can simplify it…. If you want a program that you can do live performances with, Ableton or Bitwig are for you. If you want the familiarity of Garage Band, but with more advanced and powerful features, Logic Pro X. And if you need to learn how to use them (at some point you’ll probably want to get a couple tutorials), you can always bookmark this post for later. All the best Nathan! Let me know if you have any further questions.